OSGi with Eclipse Equinox. This tutorial gives an overview of OSGi and its modularity layer. 1.1. What is software modularity? An application consists of different parts, these are typically called software components or software modules. These components interact with each other via an Application Programming Interface (API). The API is defined as a set of classes and methods which can be used from other components. A component also has a set of classes and methods which are considered as internal to the software component. If a component uses an API from another component, it has a dependency to the other component, i.e., it requires the other component exists and works correctly. A component which is used by other components should try to keep its API stable. This avoids that a change affects other components. But it should be free to change its internal implementation. Java 9 provides its own module system to describe software component dependencies. But the Java module system has not yet been adapted by the module system used by Eclipse. The OSGi specification defines its own module system, which is a bit more flexible than the Java module system. OSGi is a set of specifications. Its core specification, defines a component and service model for Java. A practical advantage of OSGi is that every software component can define its API via a set of exported Java packages and that every component can specify its required dependencies. The components and services can be dynamically installed, activated, de-activated, updated and de-installed. The OSGi specification has several implementations, for example Eclipse Equinox, Knopflerfish OSGi or Apache Felix. Eclipse Equinox is the reference implementation of the base OSGi specification. It is also the runtime environment on which Eclipse applications are based. The OSGi specification defines a bundle as the smallest unit of modularization, i.e., in OSGi a software component is a bundle. The Eclipse programming model typically calls them plug-in but these terms are interchangeable. In this tutorial the usage of plug-in is preferred. A plug-in is a cohesive, self-contained unit, which explicitly defines its dependencies to other components and services. It also defines its API via Java packages. Technically, OSGi plug-ins are .jar files with additional meta information in the META-INF/MANIFEST.MF file. This file is called the manifest file. It is part of the standard Java specification. The OSGi specification defines additional metadata for this file. According to the Java specification, any Java runtime must ignore unknown metadata. Therefore, OSGi plug-ins can be used without restrictions in other Java environments. The following listing is an example for a manifest file. The following table gives an overview of the OSGi meta-data used in the manifest file. Short description of the plug-in. Defines the plug-in version and must be incremented if a new version of the plug-in is published. Defines an optional activator class which implements the BundleActivator interface. An instance of this class is created when the plug-in gets activated. 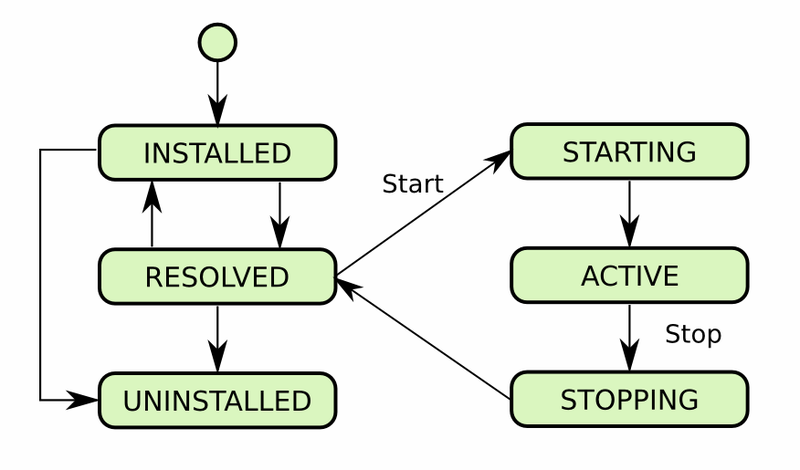 Its start() and stop() methods are called whenever the plug-in is started or stopped. 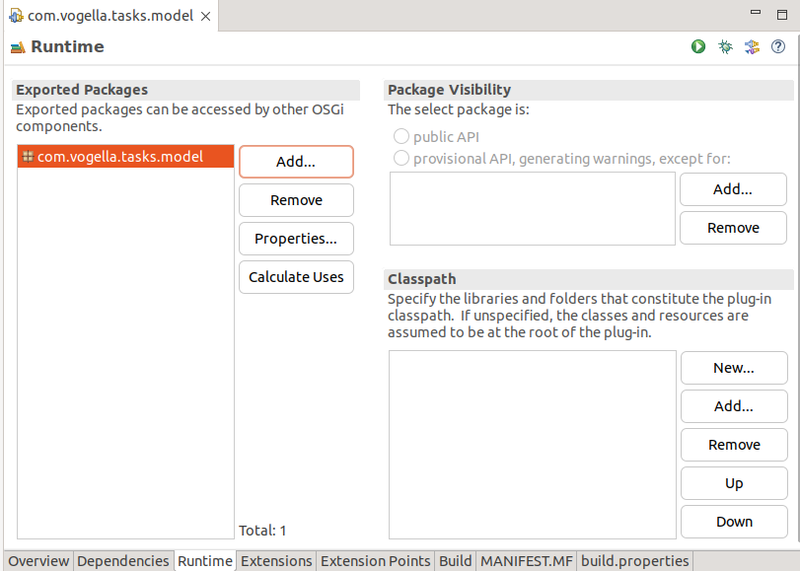 An OSGi activator can be used to configure the plug-in during startup. The execution of an activator increases the startup time of the application, therefore this functionality should be used carefully. Specify which Java version is required to run the plug-in. If this requirement is not fulfilled, then the runtime does not load the plug-in. Setting this to lazy instructs the OSGi runtime that this plug-in should only be activated if one of its components, i.e. classes and interfaces are used by other plug-ins. If not set, the Equinox runtime does not activate the plug-in, i.e., services provided by this plug-in are not available. The Bundle-ClassPath specifies where to load classes from the bundle. The default is '.' which allows classes to be loaded from the root of the bundle. You can also add JAR files to it, these are called nested JAR files. The combination of Bundle-SymbolicName and Bundle-Version uniquely identifies a plug-in. Each plug-in has a unique name (id) which is defined via the Bundle-SymbolicName property. By convention, this name uses the the reverse domain name of the plug-in author. For example, if you own the "example.com" domain then the symbolic name would start with "com.example". Each plug-in defines its version number in the Bundle-Version property. OSGi recommends to use the following schema for versions in the Bundle-Version field identifier. If you change your plug-in code you increase the version according to the following rule set. <major> is increased if changes are not backwards compatible. <minor> is increased if public API has changed but all changes are backwards compatible. <service> is increased if all changes are backwards compatible. For more information on this version scheme see the Eclipse Version Numbering Wiki. Sometimes you need to access information about the bundle, e.g., the bundle version or the bundle name. Access to the bundle and its bundleContext is performed via the Bundle and BundleContext class. You can use the FrameworkUtil class from the OSGi framework to access the BundleContext for a class. OSGi prevents access to classes from other plug-in without a defined dependency. The only exception are packages from the Java runtime environment (based on the Bundle-RequiredExecutionEnvironment definition of the plug-in). a plug-in dependency: your plug-in can access all exported packages of this plug-in. a package dependency: your plug-in can access this package. Using package dependencies allows you to exchange the plug-in which provides this package. The OSGi specification promotes the usage of package dependencies. If you require this flexibility, prefer the usage of package dependencies. If you add a dependency to your manifest file, the Eclipse IDE automatically adds the corresponding JAR file to your project classpath. A plug-in can define that it depends on a certain version (or a range) of another bundle. For example, plug-in A can define that it depends on plug-in C in version 2.0. Another plug-in B can define that it depends on version 1.0 of plug-in C.
The OSGi runtime reads the manifest file of a plug-in during startup. It ensures that all dependencies are present and, if necessary activates the dependency plug-in, before it starts a plug-in. With the installation of a plug-in in the OSGi runtime the plug-in is persisted in a local bundle cache. The OSGi runtime then tries to resolve its dependencies. If all required dependencies are resolved, the plug-in is in the RESOLVED status otherwise it stays in the INSTALLED status. In case several plug-ins exist which can satisfy the dependency, the plug-in with the highest valid version is used. If the versions are the same, the plug-in with the lowest unique identifier (ID) is used. Every plug-in gets this ID assigned by the framework during the installation. When the plug-in starts, its status is STARTING. After a successful start, it becomes ACTIVE. This life cycle is depicted in the following graphic. For legacy reasons OSGi supports a dynamic import of packages. See OSGi Wiki for dynamic imports for details. You should not use this feature, it is a symptom of a non-modular design. In the MANIFEST.MF file a plug-in also defines its API via the Export-Package identifier. This allows you to define internal API, provisional API and API. All packages which are not explicitly exported are not visible to other plug-ins. All these restrictions are enforced via a specific OSGi classloader. Each plug-in has its own classloader. Access to restricted classes is not possible without using reflection. Unfortunately OSGi can not prevent you from using Java reflection to access these classes. This is because OSGi is based on the Java runtime which does not yet support a modularity layer. Via the x-internal flag the OSGi runtime can mark an exported package as provisional. This allows other plug-ins to consume the corresponding classes, but indicates that these classes are not considered as official API. 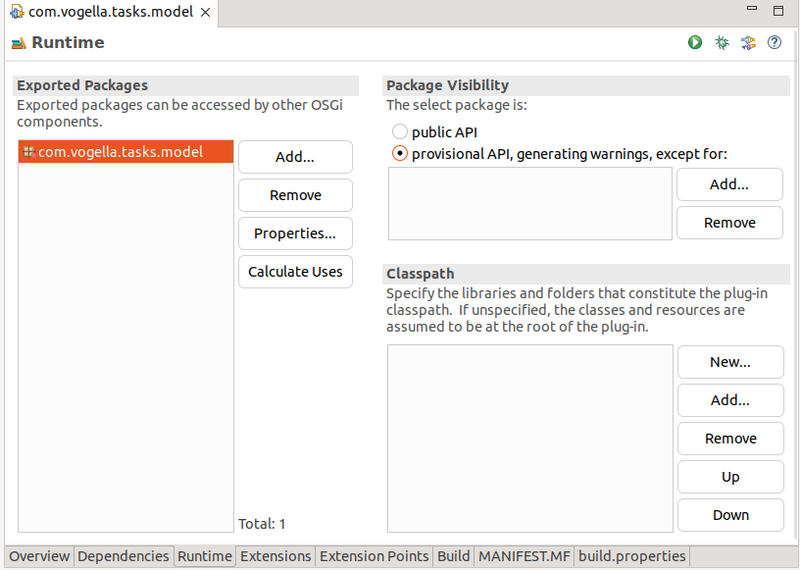 The following screenshot shows how to set a package as x-internal in the manifest editor. This is how the corresponding manifest file looks like. You can configure how the Eclipse Java editor shows the usage of provisional API. Such an access can be configured to be displayed as, error, warning or if such access should be result in no additional message. The default is to display a warning message. You can adjust this in the Eclipse preferences via the Window Preferences Java Compiler Errors/Warnings preference setting. You can define that a set of plug-ins can access provisional API without a warning or error message. This can be done via the x-friends directive. 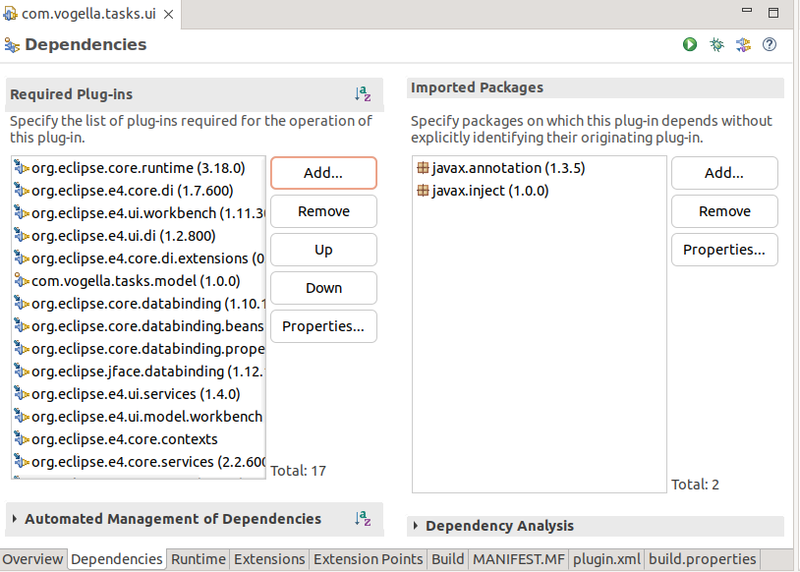 This flag is added if you add a plug-in to the Package Visibility section on the Runtime tab of the manifest editor. The x-friends setting has the same effect as x-internal but all plug-ins mentioned in the x-friends setting can access the package without receiving an error or warning message. An OSGi runtime allows the developer to mark Java packages as public, provisional or internal APIs. The internal API is private, therefore not visible. The provisional API are to test non-finalized APIs, therefore are visible but non-stable. The public API, or simply API, are the visible and stable API, that can be reused by other components. The Eclipse platform project marks packages either as public API or as provisional API, to make all Java classes accessible to Eclipse developers. If the Eclipse platform project releases an API, the platform project plans to keep this API stable for as long as possible. If API is internal but accessible, i.e., marked as provisional, the platform team can change this API in the future. If you use such API, you must be prepared that you might have to make some adjustments to your application in a future Eclipse release. If you use unreleased API, you see a Discouraged access: The …​is not API (restriction on required project …​) warning in the Java editor. You can turn off these warnings for your workspace via Window Preferences Java Compiler Errors/Warnings and by setting the Discouraged reference (access rules) flag to Ignore. 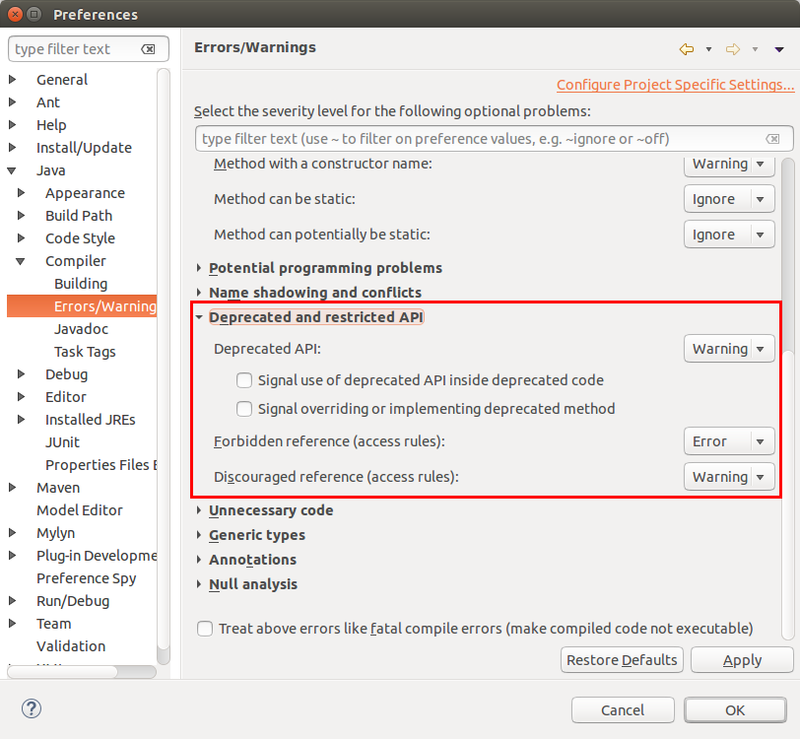 Alternatively you can turn off these warnings on a per project basis, via right-click on the project Properties Java Compiler and afterwards use the same path as for accessing the global settings. You might have to activate the Enable project specific settings checkbox at the top of the Error/Warnings preference page. If you specify the -console parameter in your launch configuration Eclipse will allow you to interact with the OSGi console. An OSGi launch configuration created with the Eclipse IDE contains this parameter by default. Additionally use -noExit to keep the OSGi console running, even if the application fails to start. This is useful for error analysis. The OSGi console is like a command-line shell. In this console you can type a command to perform an OSGi action. This can be useful to analyze problems on the OSGi layer of your application. Use, for example, the command ss to get an overview of all bundles, their status and bundle-id. The following table is a reference of the most important OSGi commands. Lists the installed bundles and their status. Lists bundles and their status that have vogella within their name. Starts the bundle with the <bundle-id> ID. Stops the bundle with the <bundle-id> ID. Diagnoses a particular bundle. It lists all missing dependencies. Installs a bundle from a URL. Uninstalls the bundle with the <bundle-id> ID. Shows information about the bundle with the <bundle-id> ID, including the registered and used services. Shows the MANIFST.MF information for a bundle. Shows all available services and their consumer. Filter is an optional LDAP filter, e.g., to see all services which provide a ManagedService implementation use the "services (objectclass=*ManagedService)" command. The following plug-ins are necessary to use the OSGi console. The easiest way to add them to your Eclipse application is to add them directly via the runtime configuration. If you want to access your application via a Telnet client, you can add another parameter to the -console parameter. This specifies the port to which you can connect via the telnet protocol. To access such a application, use a telnet client, for example on Linux: telnet localhost 5555 from the command line. In an OSGi console accessed via telnet, you can use tab completion and a history of the commands similar to the Bash shell under Linux. The specification of the port cannot not be used, if you want to to access the OSGi console via the Console view of the Eclipse IDE. Use only -console for this. 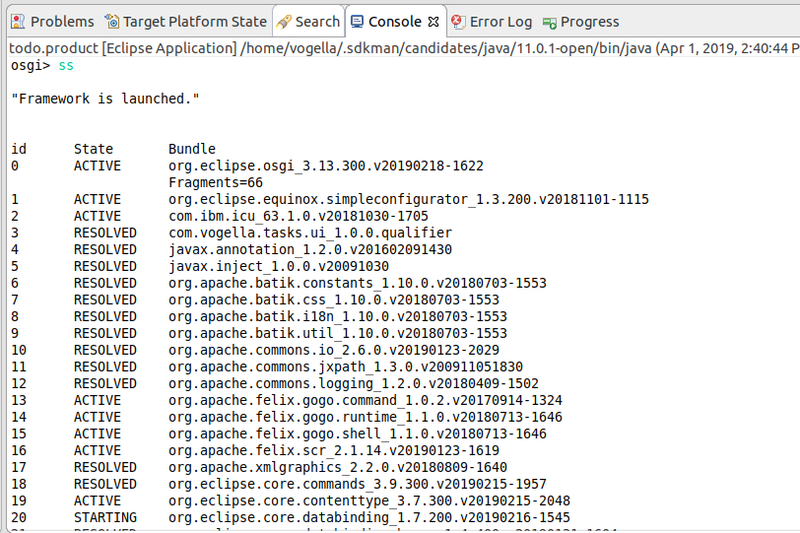 You can also access the OSGi console of your running Eclipse IDE. In the Console View you find a menu entry with the tooltip Open Console. If you select Host OSGi Console, you will have access to your running OSGi instance. Please note that interfering with your running Eclipse IDE via the OSGi console, may put the Eclipse IDE into a bad state. 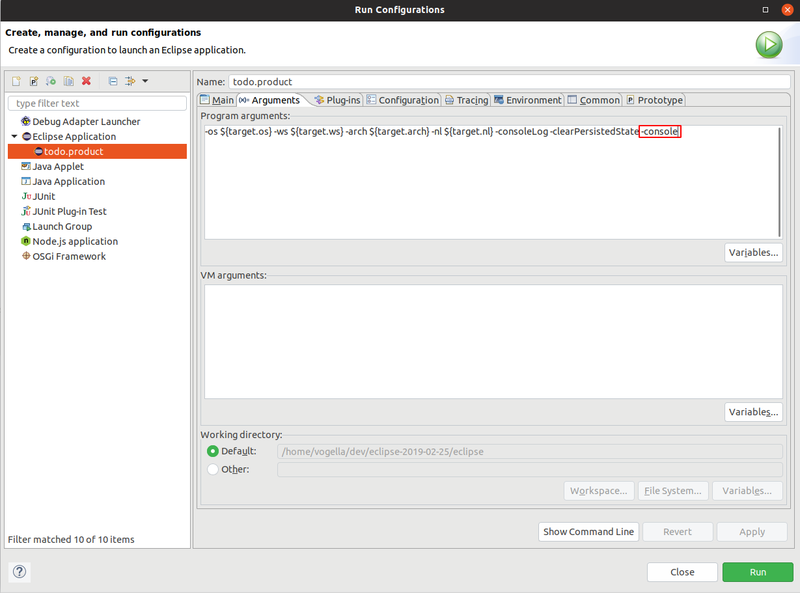 This requires that the plug-in development tooling (PDE) is installed in your Eclipse IDE. If you are able to create plug-ins via the wizard than the PDE tooling is installed. If you plan to add functionalities to the Eclipse platform, you should download the latest Eclipse release. Official releases have stable APIs, therefore are a good foundation for adding your plug-ins and features. The Eclipse IDE is provided in different flavors. While you can install the necessary tools in any Eclipse package, it is typically easier to download the Eclipse Standard distribution which contains all necessary tools for plug-in development. Other packages adds more tools which are not required for Eclipse plug-in development. Browse to the Eclipse IDE download site and download the Eclipse IDE for Eclipse Committers package. Eclipse provides also an Eclipse installer installer. The installer is useful, if you want to download several flavors of Eclipse. It uses a shared installation pool for common plug-ins, which reduces the required space. In this exercise you create a plug-in for the definition of your data model. You also make this data model available to other plug-ins. A plug-in can be generated by Eclipse via the File New Other…​ Plug-In Development Plug-In Project menu entry. The corresponding wizard allows specifying several options. This tutorial calls plug-ins generated with the following options a simple plug-in or simple bundle. Create a simple plug-in project called com.vogella.tasks.model. The following screenshot depicts the second page of the plug-in project wizard and its corresponding settings. Press the Finish button on this page to avoid the usage of templates. Create the com.vogella.tasks.model package and the following model class. You see an error for your final id field. This error is solved in the next section. Ensure that you have created both constructors, because they are required in the following exercises. 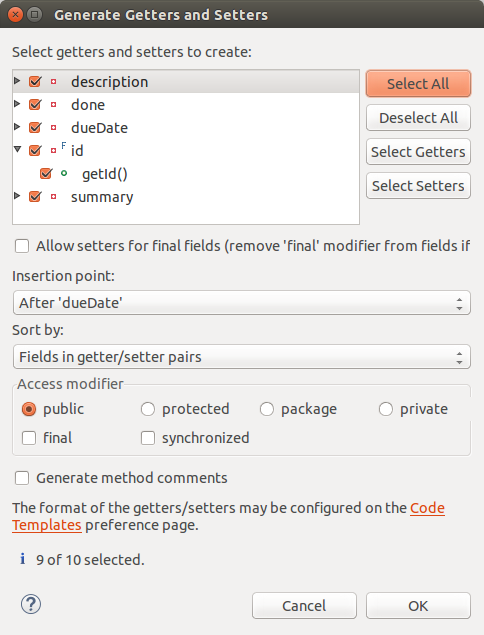 Use the Source Generate Getter and Setter…​ menu to create getters and setters for your fields. Why is the id field marked as final? The id is final and therefore Eclipse creates only a getter. This is correct and desired. We will use this field to generate the equals and hashCode() methods therefore it should not be mutable. Changing a field which is used in the equals and hashCode() methods can create bugs which are hard to identify, i.e., an object is contained in a HashMap but not found. Adjust the generated getter and setter for the dueDate() field to make defensive copies. The Date class is not immutable and we want to avoid that an instance of Todo can be changed from outside without the corresponding setter. At this point the resulting class should look like the following listing. Use the Source Generate toString()…​ menu entry to generate a toString() method for the Todo class based on the id and summary field. Use the Source Generate hashCode() and equals()…​ menu entry to generate the hashCode() and equals() methods based on the id field. Add the following copy() method to the class. The result Todo class should now look similar to the following. Create the following ITodoService interface. Export the com.vogella.tasks.model package to define it as API. For this, open the MANIFEST.MF file and select the Runtime tab. Add com.vogella.tasks.model to the exported packages. In this exercise you create a plug-in for a service implementation. This implementation provides access to the task data. This service implementation uses transient data storage, i.e., the data is not persisted between application restarts. To persist the data you could extend this class to store the data for example in a database or the file system. As this storage is not special for Eclipse plug-ins and applications, it is not covered in this tutorial. Create a new simple plug-in project called com.vogella.tasks.services. The MacOS operating system treads folders ending with .service special, therefore we use the .services ending. To use classes from other plug-ins in a plug-in, you need to add a dependency to them. The result should look similar to the following screenshot. Create the com.vogella.tasks.services.internal package in your service plug-in and create the following class. 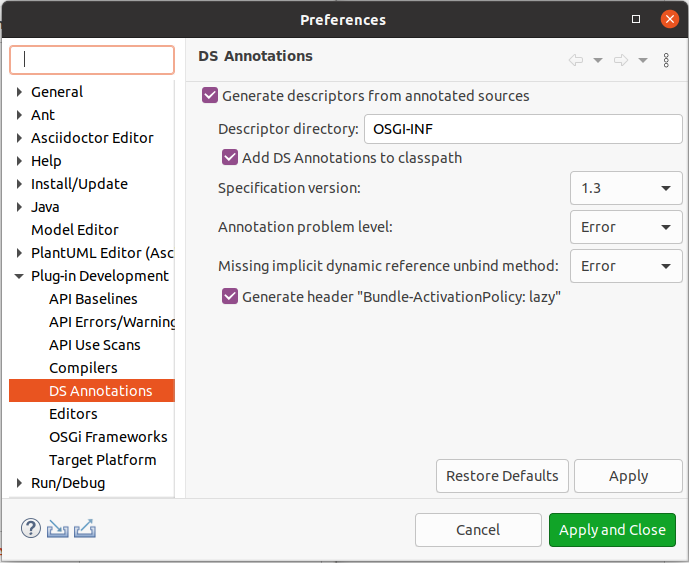 Ensure that OSGi services can be defined via annotations in the class via Window Preferences Plug-in Development DS annotations. Add the @Component annotation to your MyTodoServiceImpl class. Eclipse uses this annotation to generate the necessary files to make the MyTodoServiceImpl class available as OSGi services for the ITodoService interface. Ensure that you use the Plug-ins tab on the feature.xml file. Every time you create a new plug-in and refer to it in your MANIFEST.MF file you have to add it to your product configuration file (via your feature project). In this exercise you learn how to use dependency injection for OSGi services. OSGi DS allows to use the @Reference annotation on a method to indicate that another OSGi service you be used. Create a new plug-in project com.vogella.osgi.quote. Do not use a template, do not create an activator. 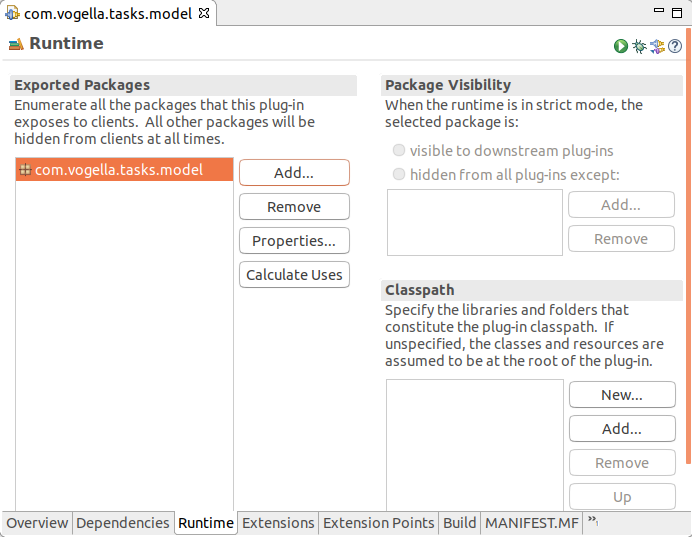 Add com.vogella.tasks.model to the dependencies in the MANIFEST.MF file. Create the QuoteService class which implements the interface IQuoteService. Now use the OSGi service, e.g., get it injected into your a part of your Eclipse application. Use System.out.println to display the result of the getQuote() method call. In this exercise you learn how to use the OSGi console to analyze your running Eclipse instance. Add the -console parameter to your launch configuration as runtime parameter. Ensure to add the following plug-ins to your runtime configuration. The Add Required Plug-ins and Validate buttons can be useful here. Start your application. In the Console view of Eclipse, use the ss, bundle and diag commands to learn about your plug-ins and services. 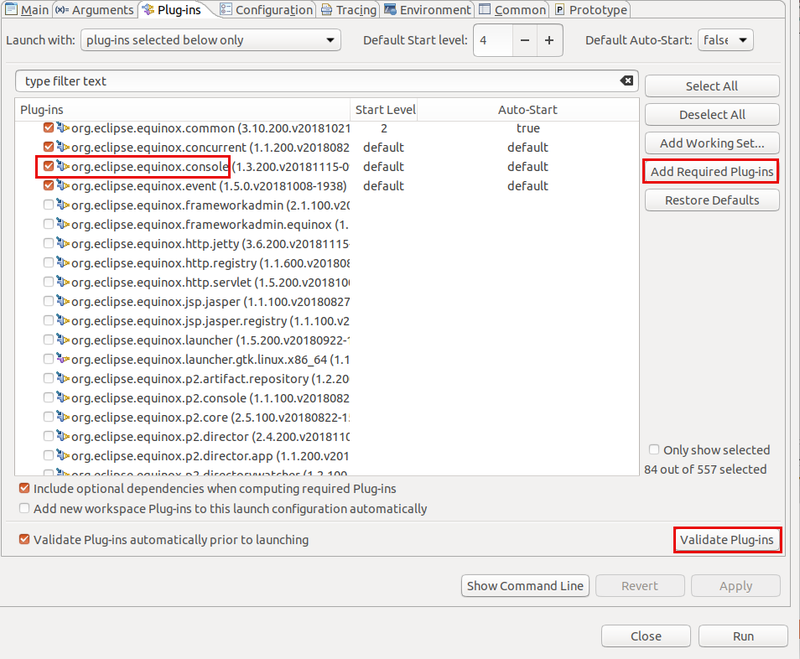 Remove one of your plug-ins from the launch configuration, start Eclipse again ignoring the warning popup and use the console to find out which plug-in is missing. The following Tag class is used to group Todo objects. Create the following interface in your com.vogella.tasks.model plug-in. 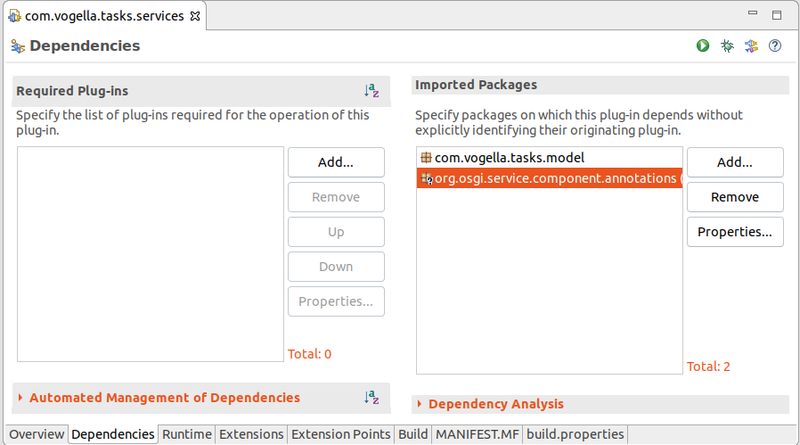 In your com.vogella.tasks.services service plug-in create the implementation of the TagService as an OSGi service. The preferred way of defining OSGi services is using annotation and generated meta data. But you have more options if you need them. This chapter serves as a reference to other ways of defining OSGi services, feel free to skip them. A bundle can also register itself for the events(ServiceEvents) of the BundleContext. These are, for example, triggered if a new bundle is installed or de-installed or if a new service is registered. In the registerService() method from the BundleContext class you can specify arbitrary properties in the dictionary parameter. You can use the getProperty() method of the ServiceReference class from the org.osgi.framework package, to access a specific property. A bundle can acquire a service via the BundleContext class. The following code demonstrates that. Avoid using activators as they can slow down the startup of your application. A bundle can define a Bundle-Activator (Activator) in its declaration. This class must implement the BundleActivator interface. If defined, OSGi injects the BundleContext into the start() and stop() methods of the implementing Activator class. // do something with the context, e.g.